New to Stock - Monte Enebro - Zuercher & Co.
Cheesemakers Paloma and Rafael Baez are behind this unique Spanish beauty. 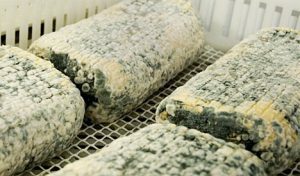 Monte Enebro is aged for 30-45 days and incorporates Penicillium roqueforti onto its rind. As you may know, this is the same mold used in blue cheeses, such as Roquefort and Stilton. This may account for why the cheese has a peppery, earthy, walnut flavor. Additionally, “enebro” translates to juniper in English, and although the specifics of Monte Enebro are a bit elusive, the resinous pine flavor of juniper can be noted, as well. It’s defining grey/black exterior is a striking contrast to the pure white center of the paste. The rind is deceptive however, it’s not ash…..it’s mold! It’s the result of mottling of the blue green mold as it ages over the month. Check out the wild mold growing on these before they get patted down! 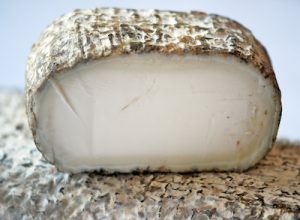 The shape of Monte Enebro is similar to other Spanish cheeses described as a “mule’s leg.” The texture is extremely dense, almost crumbly, but turns creamy on the palate, and happily lingers on the tongue. A great wine pairing would be a rosé made from Grenache, which is naturally crisp and peppery, and would provide a match to this assertive cheese. Spicy, dry farmhouse ales (a.k.a. Saison beers) also stand up well to Monte Enebro.